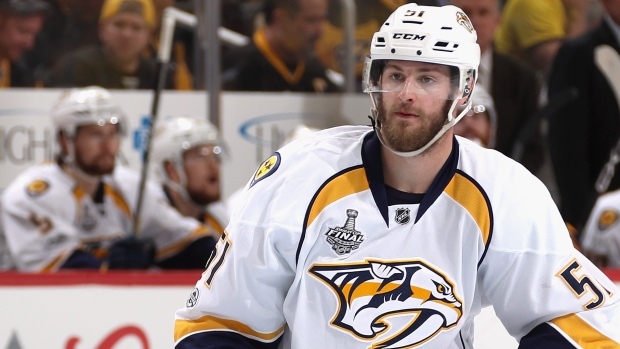 NEW YORK — Nashville Predators forward Austin Watson's suspension for domestic abuse has been reduced from 27 to 18 games by an arbitrator. The NHL and the NHL Players' Association announced arbitrator Shyam Das' decision Thursday. Commissioner Gary Bettman handed down the suspension last month. Watson pleaded no contest in July to a charge of domestic assault stemming from an incident in June, and the NHL found Watson engaged in unacceptable off-ice conduct. The Predators weren't involved in Watson's appeal but have supported the forward . Watson has been able to use the team's resources and practice with Nashville during his suspension, and he was on the ice Tuesday night in full uniform before the Predators' home opener as the team hung banners for winning the Central Division and Presidents' Trophy last season. "We are aware of its reduction to 18 games," the Predators said in a statement. "As previously stated, our focus has and will continue to be the health and well-being of Austin and his family." Now Watson is eligible rejoin the Predators on Nov. 15 when they wrap up a five-game road trip Arizona. If the 27-game ban had stood, he would have been out until Dec. 3. Watson was charged in an incident June 16 with his girlfriend after a witness flagged down a police officer to a gas station in Franklin, Tennessee. Watson told police he and his girlfriend were arguing and that he pushed her. Officers said they found red marks on her chest, and she said Watson caused them. Watson pleaded no contest to domestic assault on July 24. As part of that plea, Watson can have the misdemeanour charge dismissed by fulfilling terms of the diversion program. Watson must serve three months of probation and complete both an in-patient treatment program and a batterer's intervention program.